You will find it easy to find food in Jakarta. This capital city of Indonesia serves as a melting pot for Indonesian and International cuisine. It is one of the advantages of living in Jakarta and experiencing all of its perks. There is always something for everyone, the seafood lover, the street food, vegetarian or the fancy dinner. There is a various restaurant in Jakarta. There are numerous vegetarian restaurants, International cafes, simple rustic street vendors and many more. International restaurants in Jakarta is among the best in the country, with International chains, elegant atmosphere, and a world-class prestige. One of them is the remarkable Japanese cuisines. You can easily find a wide variety of fancy Japanese restaurant, seafood, and desserts. Jakarta has a soft spot for Japanese food. Their unique presentation and taste appeal and receive a great response in the city. The Japanese cheesecake has been favorite for sweet dessert fans. Jakarta also has many places that serve the best cheesecake in the city. Moreover, the power of social media enables these cheesecake shop to be recognized by other people outside the city. many come to Jakarta just to taste these amazing cheesecakes. 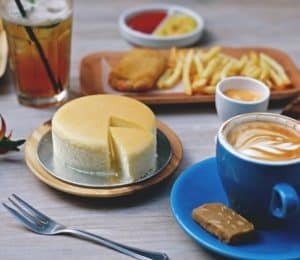 Here are some of the best cheesecake in Jakarta serving the legendary bites. Pablo store in Gandaria City, this has been a Jakarta favorite cheesecake place despite the long queues. Their iconic cheesecakes come in two sizes. Normal and mini. The classical Japanese cheesecake has a soft feature with a mild flavor. The store has various taste to try such as matcha, chocolate, and premium (with crunchy creme brulee taste). Costumers can also find this store in Pablo Neo Soho, in West Jakarta. This international chain cheesecake store from Hongkong has made a home in Jakarta. 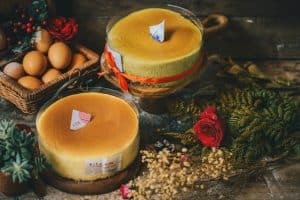 This gourmet cheesecake brand was started from the online store first and gradually make its way to Jakarta famous to go place for cheesecakes. Costumers can order their products online or their outlet in Kota Kasablanka and a cafe at Ciniru. 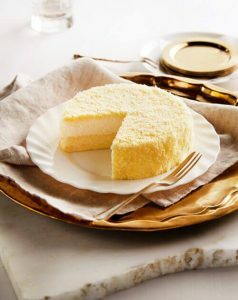 Their popular cake is the Kyoto white cheesecake with amazingly soft and fluffy texture. The claims to use only the best ingredient. Moreover, with the many lines here, their claim must be true. This place also serves free infused water that goes well with the sweet dishes that they serve. This small but cozy cafe also serves savory food for any big eater that want to have something sweet and savory. You can have a full dining experience at an affordable price. You don’t need to go far to decide what to eat in Jakarta. The best thing about Hokkaido’s cheese tart is that it comes in a finger size. So small, bite-size and perfect for any occasions. They claim to always have freshly baked cakes, so no one should worry about their freshness. Costumers can try various variations on their cake and tart. Among the most popular cheese tarts are dark chocolate and red bean matcha. The Hokkaido cheesecake gains much popularity that it is always a sure thing to see a long line people wanting to buy this sweet dessert. DORÉ is a sub-brand chain of LeTao, the best selling cheesecake in Hokkaido, Japan. You can be sure to find true cheesecake from the origin country itself. Now, this store opens a branch in Indonesia, DORÉ by LeTAO serves the most delicate and velvety cheesecake masterpieces. The most must try cake is their 5-inch cakes come in original taste. Other flavors include chocolate, red bean, and matcha flavors. Among other rich and tasty sweet selections are cookies, creams, butter cookies, and palmier, plus their cheesy cheese pot (Pot de Fromage) for more cheese choices. Get indulged with their milky sweetness. Their signature Fromage cake reflects Japanese Otaru’s beauty in winter. There is a bit of snow icing when you are biting into a layer of no-bake mascarpone melts through to fluffy baked cream cheese. Choosing their wide range selecting would be troublesome. Hokkaido Baby offer bites size cheesecake in their cutest form. 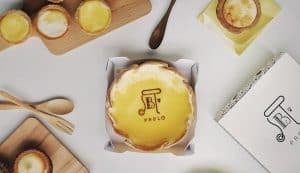 It offers not only to offer original, chocolate and matcha cheesecake flavors, but also a salted egg cheese tart. Their savory tart is a combination of the savory salted egg and the sweetness of melting cheese. For more crunchy bites, try their choux menu that comes in cheese and chocolate fillings. This popular cheesecake store in Jakarta is a sister company of Sour Sally. Therefore, you can expect amazing taste and great textures. 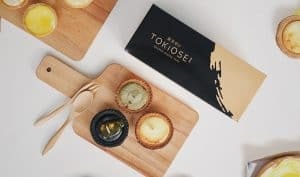 The Black Yuzu Cheese Tart is their signature menu in Tokiosei. You will experience a unique and super yummy combination of charcoal, cheese, yuzu, and natural detox powder. Other than the golden and Genmaicha ones, make sure you also try the taro (sweet potato) flavor. This special flavor only available in Tokiosei. You can visit their stores in Emporium Mall Pluit Level 2, Penjaringan, North Jakarta. Their small cheesecake and cheese tart also quite famous among their costumer. This cute Japanese store serves light and fluffy cheesecake. Fuwa means fluffy in Japanese. So if you are a sweet light and soft cheesecake fans, this is the best place for it. This cafe serves one of the fluffiest cheese tarts in town with all of their fresh products are made with original Japanese technique. It has the super soft dough with an amazing mouth-watering aroma. Their signature dish is cheesecake, but other sweet treats such as cheese tart, the pillow bread are also among their best products. You can find their store in Penjaringan or the Central Park, Jakarta. This last cheesecake place in Jakarta marks its first store in Grand Indonesia, Jakarta. The International chain store already owning stores in several countries in Asia. This Hokkaido-based Japanese snacks maker offers an irresistible variation of cheese made from four different cheese (3 from Hokkaido, 1 from France) and through two-time oven baking. There you have it. some of Jakarta best cheesecake store to satisfy your sweet needs. There many choices to munched your way in Jakarta. Their snacks selection is varied and endless. Make sure to stop by to any of these cheesecakes and experience the cheese by yourself.